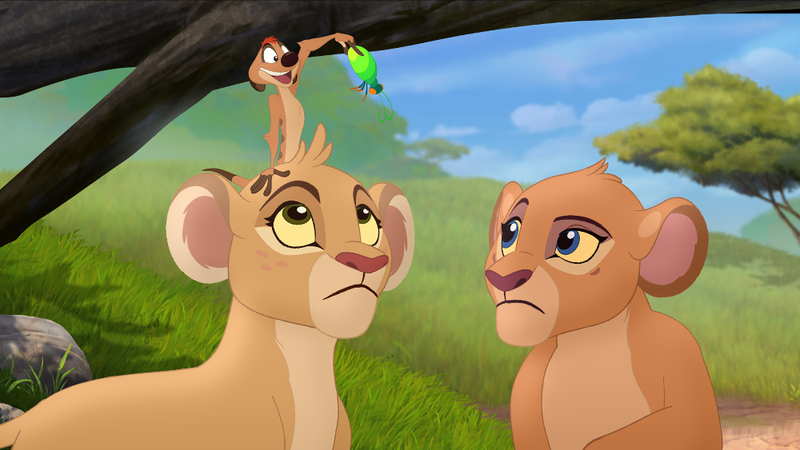 I’m not sure who asked for a Lion King animated series for small children but we have gotten it with Disney Jr’s The Lion Guard. I recently watched the 1 hour premiere and had mixed feelings about it. 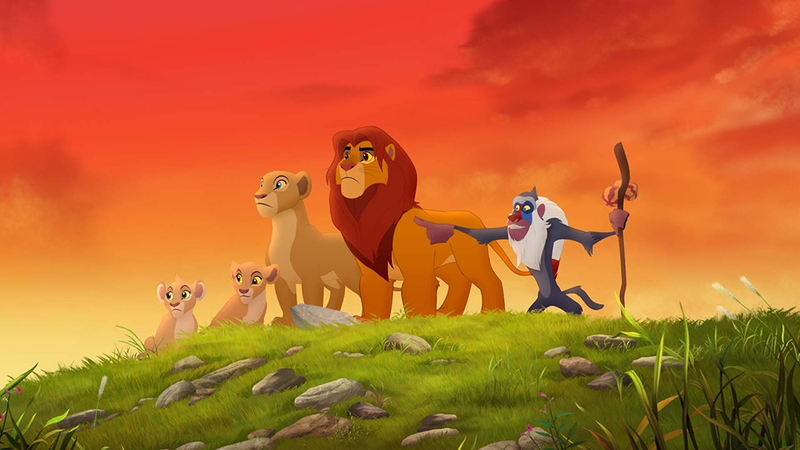 I love Lion King and had it in my Top 50 Animated Films, but am not quite as high on it as many who have it as their favorite animated film ever. I’m not sure what those fans will think of this addition, so if you are let me know! Let’s talk about the things I liked in the premiere. The most important stand-out is the animation. Disney has been doing an amazing job with their 2D and CG TV offerings. Whether it is Star Wars Rebels, Wonder Over Yonder, Disney’s Mickey Mouse, Gravity Falls, the TV animation is on par with the film animation. It really is and Lion Guard is no exception. While perhaps not the masterpiece quality of the original it still looks great. I haven’t seen the sequels for some time so I can’t compare the animation in those but Lion Guard I thought looked smooth, bright, colorful with beautiful backdrops. I also thought the mythos behind the Lion Guard and Scar losing his roar was pretty good. The group of 5 in the guard should be fun for small kids to follow on adventures protecting the Pridelands from villains. 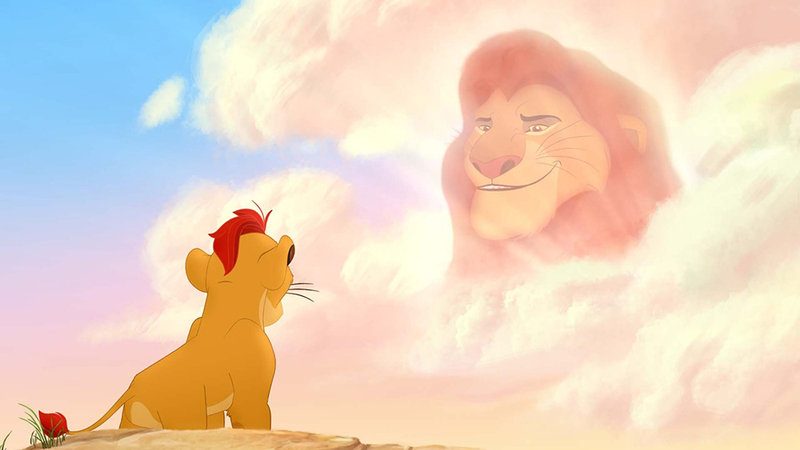 The voice casting was solid with Rob Lowe voicing Simba and Gabrielle Union Nala. I also liked Atticus Shaffer from underrated show The Middle as the voice of Ono the egret of the Lion Guard. The score by Christopher Willis and Beau Black is excellent even if the songs were very lame. I am not a fan of the sarcastic, hip tone we got from lead Kion but there was admittedly some of that in the original with Simba wanting to be king and all. For some reason, I found it more grating here. Also the character of Bunga, a honey badger that reminded me of Terk from Tarzan, was very annoying. He’s supposed to be Kion’s snarky friend but most of the time it came across as forced and obnoxious. I also didn’t like the way the females were all either insecure or arrogant divas. In a way I kind of wish that Kiara would have been the lead of the story but she is relegated to being rescued in the premiere. I particularly didn’t like Zuri who complains about her nails and getting dirty. Plus Hakuna Matata was not about not working. It was about not worrying. That’s not exactly the same thing. It’s about not having problems and Simba realized it was wrong and certainly wouldn’t have been teaching his son some new version of it called Zuka Zamba. It just felt kind of like a bargain basement rip off of a highlight from the original film. There are also lots of jokes and puns about the original, which got a little old. Even Rafiki saying ‘it is time’ and then Kion singing ‘It is Time’ song made me roll my eyes! Couldn’t they have thought about something else for Rafiki to say? I was also disappointed to see the hyenas as the main villains. 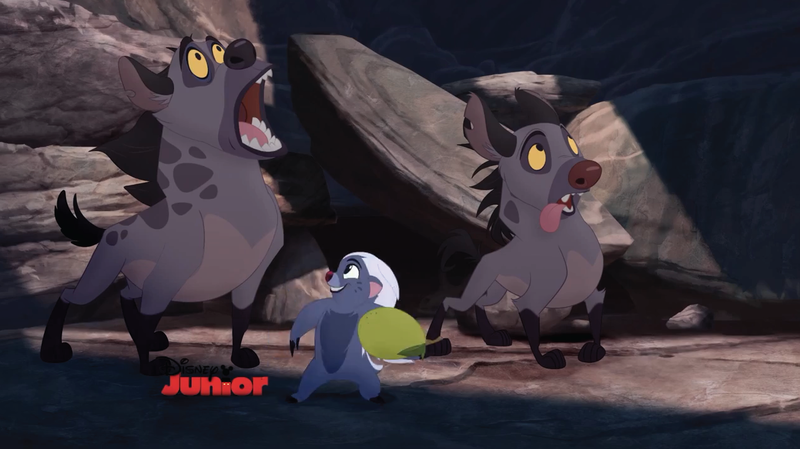 They are so stupid that I don’t think they will be tough for the Lion Guard to defeat. I understand it is a show for very small children but why not have a child of Scar be the main villain? That would be really cool. You’ve got to imagine as King he fathered cubs? Scar is possibly my favorite Disney villain so this seems like a serious downgrade. Overall, I think it is an all right animated series that small children will probably enjoy. The animation is good quality and the voice work I liked. It’s basically Lion King fan fiction so its appeal will partly depend on how open you are too new properties in that world. However, I felt many of the attempts to tie back into the original felt lame and generic. The attempts at potty humor, songs like Zuka Zama annoyed me. 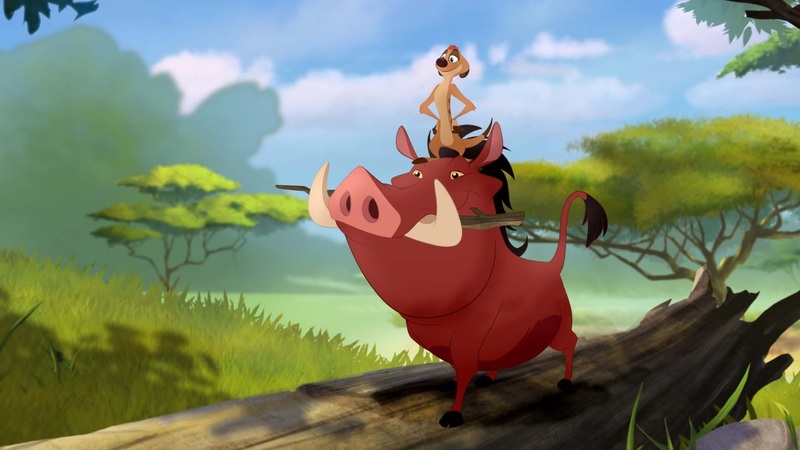 They don’t show any growth on the part of Timon and Pumba from the original film. The songs in general were mediocre. I also didn’t care for the way the girl characters were portrayed and Bunga I found very annoying. That said, not a bad watch and will be curious how the series works out. If you have seen it put in the comments section and let me know what you thought- especially if you are a big Lion King fan. Oh good point. I also didnt like that line about the talk. The humor in general didnt work for me. Gabrielle Union as Nala? It seems a bit odd. So all of this takes place when he is a child, still at the Pride, though Mufasa is dead. Okay. It seems like Simba’s lost son from the early comics is still lost. I do not know if it was a comic or not, but I remember hearing that there was some sort of story (it might have been for the Japanese or something), where Nala and Simba had a son, but in the movie and other merchandise, he has Kiara. I haven’t seen it, but I guess the biggest problem with it is that it’s intended for a Disney Jr. audience. Well, this isn’t as good as Lion King itself, I’ll give you that. 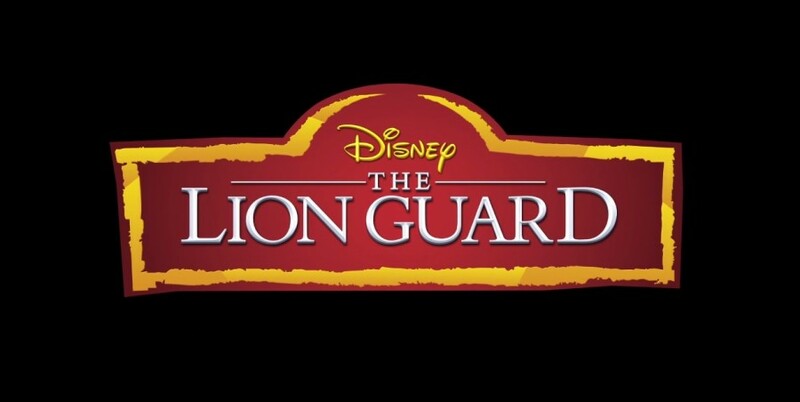 Still, I actually enjoyed Lion Guard. Also, I actually liked songs such as “Zuka Zama” and “Tonight We Strike.” Nevertheless, I respect your opinion on this show. I’m curious to see how the rest of the episodes then out when it officially airs in January. Yes, I know you did. Still, I just thought I’d mention that there were some things that I liked even if they were things that maybe you didn’t like, or others may not have liked, you know? Anyway, I’m glad to hear that you gave this show a C+, as opposed to say a D or F or something like that. Well, I’m curious to hear your thoughts on the rest of the episodes in this season of the show, or other seasons of this show that are yet to come. The one thing I was a little iffy on was the fact that most of the voice cast from the original film had changed except for the ones for Pumbaa and Mufasa. Oh well! Yeah but I thought they were good voice casting. Oh, I do too. Still, if most of the actors and actresses within the cast are still alive, I think they should have tried to bring most of the original cast back, you know? 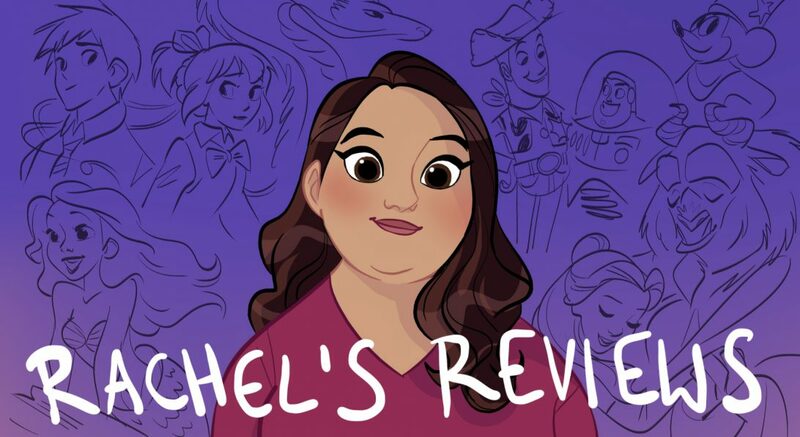 I mean with instances like say sequels from Disney Toon Studios like Lady & The Tramp 2: Scamp’s Adventure, The Jungle Book 2, Return To Never Land, I’d say it was definitely more understandable why the cast changed in those instances. I mean the original Disney Classics of those films came out in what the 50s or 60s. So, since those sequels came out, in those cases, in the 2000s, I can why the cast changed in the sequels. Why? Well, because most, if not all of those actors most likely passed away probably before the 2000s and maybe before the 90s or 80s, you know? But here, come on! It’s only been what, 20 years or more since Lion King came out. But whatever, I guess. Well, all I’m saying is that I’m not necessarily mad about the cast change, I’m just a little disappointed, if that makes sense. The new cast is alright, but I’m sure I’ll get used to it. 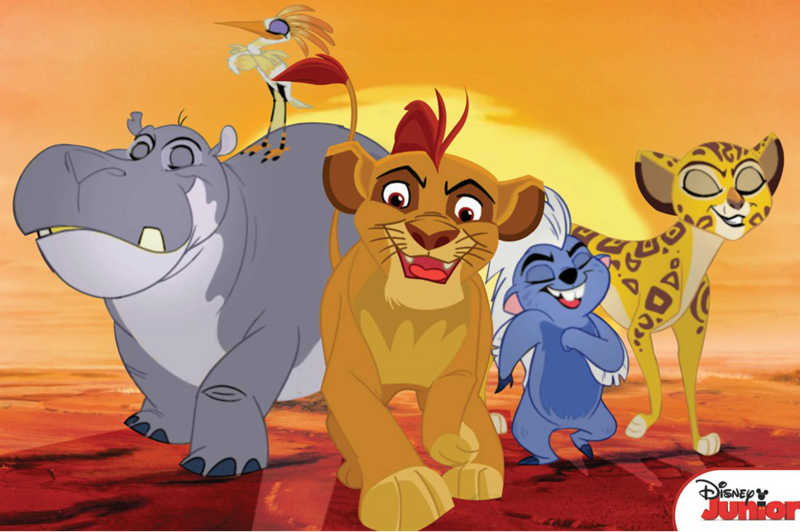 I guess maybe I’m just used to the fact that they had most of the same cast from the original Lion King for the sequels Lion King 1 1/2 and Lion King 2: Simba’s Pride (except they changed the voice role for Zazu apparently). Oh, and another thing! I thought it was cool that the hyenas had a vulture for their leader this time around. Anyway, I’m sorry if you felt like I was saying that it was bad that they used a completely different cast, for this most part, for this show. Oh, and for the record, I’m glad you still enjoyed the season premiere of this show that’s to air regularly in January. For sure! Well, they did a lot of that in Lion King 2. Better than nothing, I’ll say! Gotcha! Well, feel free to check that sequel out fairly soon if you want. Pingback: 2016 Animated Emmy Nominations – Reviewing All 54 Disney Animated Films And More!